The Human Resources Guide, Handbook, Policies, and Code of Conduct is designed to be the starting point for creating your own company human resource manual that references many of the employee and contractor forms and agreements. This Human Resources Guide is included in editable Word format that can be customized in Word or by using the included Wizard software. (Employee Handbook, HR Employment Policies, Code of Conduct). 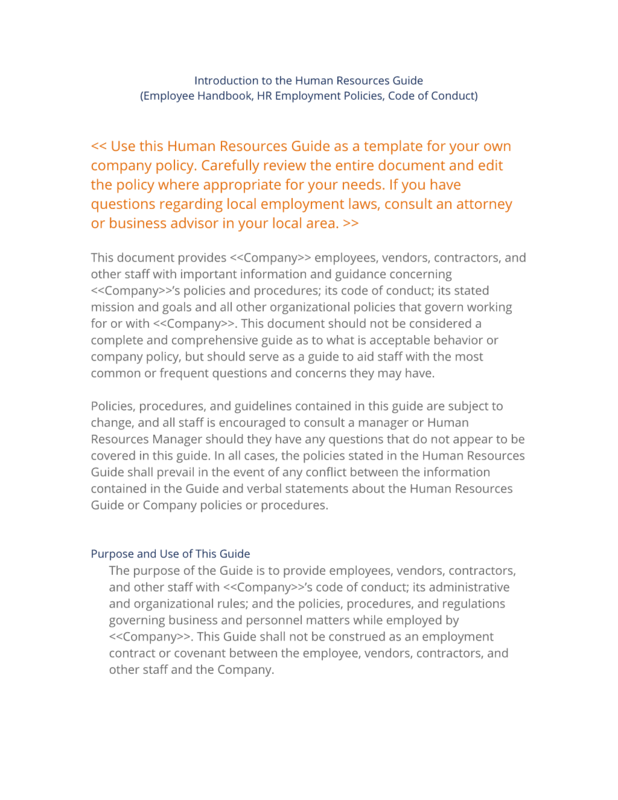 Use this Human Resources Guide as a template for your own company policy. Carefully review the entire document and edit the policy where appropriate for your needs. If you have questions regarding local employment laws, consult an attorney or business advisor in your local area. This document provides Company Name employees, vendors, contractors, and other staff with important information and guidance concerning Company Name's policies and procedures; its code of conduct; its stated mission and goals and all other organizational policies that govern working for or with Company Name. This document should not be considered a complete and comprehensive guide as to what is acceptable behavior or company policy, but should serve as a guide to aid staff with the most common or frequent questions and concerns they may have. Policies, procedures, and guidelines contained in this guide are subject to change, and all staff is encouraged to consult a manager or Human Resources Manager should they have any questions that do not appear to be covered in this guide. In all cases, the policies stated in the Human Resources Guide shall prevail in the event of any conflict between the information contained in the Guide and verbal statements about the Human Resources Guide or Company policies or procedures. The purpose of the Guide is to provide employees, vendors, contractors, and other staff with Company Name's code of conduct; its administrative and organizational rules; and the policies, procedures, and regulations governing business and personnel matters while employed by Company Name. This Guide shall not be construed as an employment contract or covenant between the employee, vendors, contractors, and other staff and the Company. All employees must read and become familiar with these policies and procedures and refer to this Guide as a reference if they have questions and concerns about conduct and company policies or procedures. Definitions of Personnel covered under this Code of Conduct shall include, but are not limited to: Employees, Temporary Employees, Volunteers, Contractors, Consultants, Vendors, Staff, or any other personnel conducting work for or on behalf of Company Name. The term "Employee" shall be interchangeable with all other definitions of personnel unless otherwise noted. Company Name shall be responsible for distributing to all new employees, vendors, contractors, and other staff a copy of the Human Resources Guide in print or electronic format(s). Responsibility of Employees, Vendors, Contractors, and other Staff. Employees, vendors, contractors, and other staff shall be responsible for reading and signing this document and returning a signed copy to Company Human Resources Department or a designated representative or agent. This Guide will also serve as a guide to the benefits offered to employees by the Company. These policies and benefits are subject to change at the Company's sole discretion and are not intended to be part of any compensation agreement or promise. Unless specified in writing elsewhere, all employment with Company is "at will" and may be terminated by the Company or employee at any time for any reason or no reason at all. It is the policy of the Company to comply with Federal and State laws and regulations governing Health, Civil Rights, Sexual Harassment, Disability, Equal Pay, Education, Veterans, Fair Labor Standards, and Occupational Safety. Minimum Job requirements shall be determined on an individual basis and made available through the Human Resources Department. To be employed by Company Name, an applicant must be at least 18 years of age, except in the case of student workers. A resident alien may be employed by the Company provided he or she has documented legal proof of the right to work in the United States. An approved visa or other work permit must be provided to the Human Resources Department prior to application for a position with the Company. At a minimum, the Company shall pay The Fair Labor Standards Act (FLSA) wage and proper overtime compensation to employees subject to the provisions of the FLSA. Company is an "Equal Opportunity Employer" and all advertisements shall display the statement whenever possible. No one shall be considered "employed" by the company until a written contract is signed by both an agent of the Company's Human Resources Department and the employee. No manager, supervisor, or other employee is authorized to make an oral or written agreement for employment to any applicant. No contract shall be executed between the Company and an employee that is inconsistent with the policies and procedures contained in this Human Resources Guide. The Employment Period shall be considered to be the period of time during which the employee has uninterrupted service as an employee of the Company. New employees are introduced to working for Company Name through an initial meeting conducted between the employees and either their manager or supervisor or an agent of the Company Human Resources Department. Meetings are conducted twice a month and employees are encouraged to seek additional help and clarification of the Company policies and procedures should they require help beyond this New Employee Orientation. If an employee's job performance is determined to be below standard, the employee's manager or supervisor shall attempt to work with the employee to try to raise the employee's performance to a satisfactory level. If the employee's job performance does not improve, or the employee shows no desire to improve job performance, the Company may determine that the employee be demoted or terminated. Moving the employee to another position at a lower salary or grade level. Reclassifying the employee's existing position to a lower salary or grade level. In the case that a demotion results in a reduction in the employee's salary or grade level, such a reduction shall only take place following proper written notification sent to the employee in accordance with any applicable procedures governing such notifications. Employees who voluntarily transfer from one qualified position to another position with a lower salary or pay grade shall be paid in accordance with the lower salary or pay grade and not in accordance with the higher salary or pay grade under the previous position. If an employee's job performance warrants a promotion, management shall initiate a change of assignment for the employee, including assigning a new job description, title, or pay grade. Promotion shall only become effective by management signing and filing an approved "Employee Promotion Authorization Form" and having it recorded by the Human Resources Department. Automatic Termination Date(s) or Contract Non-renewal Date(s). In the event that an Employee's position or offer of employment has a predetermined termination or contract non-renewal date, that employee shall be designated as a Temporary Employee. The length of time that makes up the Temporary Employee's employment shall be designated as the employee's Employment Term. As it pertains to leaves of absence and other qualified time off, no time shall be granted for the period of time after the termination date. All leaves of absence, whether related to qualified benefits or not, shall only be granted within the employee's employment term. An employee of the Company may hold only one full-time position with the Company, including positions designated as temporary employment. Part-time employees may, subject to prior authorization and approval from the Company Human Resources Department, hold more than one position, subject to the policy. A full-time employee may NOT work another job outside of their employment with the Company. Any freelancing or "moonlighting" that interferes with his/her performance with the Company. Any association with or engagement in external activities or associations, whether voluntary or not, that violate Company's regulations or policies, or bring discredit to the Company. Any manipulation of the employee's normal work schedule, assignments, or other duties to accommodate external activities. Any associations with or engagement in external activities that compete or interfere with endeavors of the Company. Any former employee who resigns from his/her position with the Company in good standing and is subsequently re-employed after 180 days shall be considered a new hire for purposes of benefits and sick leave. The Company shall maintain an official personnel file for each employee in a secured area in the Human Resources Department. Employee's resume(s) and/or supporting exhibits. Copies of any official transcripts certifying degrees and certificates received or documents certifying licenses received. Benefit and Cafeteria plans or elections in which the employee and his or her dependents are enrolled. Records of all leave, vacation leave, sick leave, and all other leaves taken to date. Any Company personnel action forms or actions taken by Company personnel pertaining to employee. Any disciplinary reports or actions taken, including written reprimands, probations, suspensions, or terminations. Any performance reviews or evaluations. All pre-employment information, letters of references, examples, demos, security clearances, or other related materials. Employees shall have no right to remove any material from their personnel files. In the event that erroneous or untrue information is found within the personnel file, employees may make a written request, detailing the error and documenting any supporting information employees may have that supports their claims. A Human Resources Manager will follow up on each employee's request and take appropriate action. Change of Address, Certifications, and other Critical Information. Employees are required to report any change in name, address, telephone number(s), marital status, social security number, or number of dependents, as well as any change to certifications, degrees, or other certificates. For positions contingent upon the employee maintaining a specific certification ("critical certifications") or degree the employee will make the Company Human Resources Department aware of the renewal or expiration dates ("critical renewal dates") of such certification(s). The Company Human Resources Department will aid the employee by reminding him/her of these critical renewal dates; however, it is the employee's sole responsibility to ensure that he/she stays current with all critical certifications. It is the Company's policy to maintain a salary or hourly schedule for all positions that the Company employs. Salary and hourly wages shall be determined By signator, authorized signature or signer. The duties and responsibilities, skill set(s), education, and experience required for the position. The availability of applicants with the above skills for the position. The financial restraints and budgetary considerations. The financial status of the Company and the requirements of the Fair Labor Standards Act. Payroll is processed twice per month on the second and fourth Wednesday of the month. Unless otherwise arranged, payroll checks are issued on the Friday following the end of the pay period. Checks are distributed from the Company Accounting Department or designated payroll service. Company offers payment in either check or direct deposit formats. Errors in employee information, deductions, or banking information. Delays due to strikes, earthquakes, riots, natural disasters, or other events outside the Company's control. Checks shall be sent to the address on record for the employee unless otherwise arranged by the employee. All direct deposits shall be processed the same day as checks are processed and are subject to the individual policies of the employee's designated bank. Accompanying each check shall be a statement showing current gross and net earnings, including any itemized deductions, year-to-date earnings and other standard deductions, and annual sick leave balances. Company is required to deduct federal and state income taxes, the Federal Insurance Contribution Act (FICA) taxes, Medicare, and contributions to the respective state unemployment compensation program for the state in which the employee works. Medical, Dental or Life Insurance Premiums. Discounted Mass Transit or Transportation Flexible Spending Accounts, Medical or Dependent Care Flexible Spending Accounts, if applicable. Any amount(s) due the Company from which the employee has a financial obligation. (Uniforms, ID Cards, Company Equipment not returned, etc. Union or other professional dues. Outstanding fines that have been levied. Qualified Retirement Accounts or 401k(s). Employees are expected to work regularly scheduled hours as established by the Company and the employee's manager. Each employee is normally assigned a maximum of 40 hours per week unless otherwise approved by management. Employees are required to take one (1) hour off for their lunch or meal break. Additional Breaks or Rest Periods. Employees who work an eight (8)-hour day are allowed up two 15-minute breaks each day. Breaks may not be combined or used to leave work earlier, arrive at a later time, or extend meal breaks without prior approval from management. If the employee's position is classified as non-exempt under the provisions of the Fair Labor Standards Act, the employee shall be paid the overtime rate for his/her pay grade for all hours worked in excess of 40 within a seven-day work week. No employee shall receive overtime pay without the prior approval of management. Sick leave or vacation leave shall not be considered as hours worked in the computation of qualified overtime pay. Holidays shall not be considered as hours worked in the computation of qualified overtime pay unless the employee is required to work on the holiday. Company offers a group medical insurance program, which includes medical and dental insurance coverage for employees and their dependents. The cost of the group medical insurance is paid for by the employee. Company offers to all full-time employees a group life insurance policy with a benefit valued at twice the employee's annual salary, at no additional cost to the employee. Additional coverage may be arranged or purchased by the employee through the Company's selected vendor for Group Life Insurance. The Group Life Insurance benefit may be modified, reduced, or discontinued in the future as the Company may require. Under current law, the Federal Social Security System enables a retiring employee to supplement payments received from the State Retirement System. The Company and the employee contribute to the cost of Social Security benefits. The deduction from an employee's paycheck and the amount contributed by the Company are deposited to the credit of the employee with the state agency for Social Security according to federal regulations. Employees shall be eligible for unemployment benefits in those circumstances in which they are provided by the State Unemployment Compensation Law. Application for unemployment benefits may be initiated at the local State Employment Services Office. The Company reserves the right to protest claims submitted by employees who voluntarily quit or are terminated because of misconduct, or to take any other action permitted by applicable law. If an employee needs accommodations for a religious holiday or belief, the Company will attempt to aid the employee's wishes, provided such accommodations do not affect the safety and health of other employees; that no undue hardship is created for the Company or its employees; and that the accommodations do not violate the standards set forth in the Human Resources Guide. Office Closings Due to Emergencies, Power Failures, or Severe Weather. In the event of adverse or dangerous weather in which conditions exist that threaten employee safety, the Company may close the Company and require employees to either leave or not report to work. If a power or utility failure or any other emergency condition should prohibit the performance of regular duties, operation of equipment, or the employee's normal business functions, management may arrange alternate working arrangements via telecommuting or alternate work locations depending on the circumstances surrounding the closure. In the event that the Company decides to remain open for business, all employees will be expected to report to work as usual. Employees who notify their supervisor or manager(s) of an unusual problem or concern that may prohibit their reporting to work will be considered on an individual basis for exception by those employees' supervisor or manager(s). The Company will be closed for normal business operations in observation of regular holidays and other holidays as determined by the management and posted by the Human Resources Department. Regular employees and full-time temporary employees who are not required to work will be excused on such days without being charged leave or losing pay. In the event such staff members are required to work on a holiday, they will be granted another holiday or be paid in accordance with the Company's overtime policy. Labor Day (1st Monday in Sept.
Thanksgiving Day (4th Thursday in November). New Year's Day (January 1st). The Human Resources Department will post the yearly schedule of holidays. Full-time employees and full-time temporary employees are entitled to time off with pay for vacation or other personal reasons. An employee accrues vacation leave credits for all hours in which he or she works. Full-time employees and full-time temporary employees with less than 60 months of continuous service with the Company shall earn annual vacation leave at the rate of 10 days or 80 hours per calendar year. Maximum Accrual of Vacation Leave. Full-time employees and full-time temporary employees may accrue vacation leave up to a maximum of 160 hours. After 160 hours have been accrued, an employee shall not accrue any additional hours until the employee reduces the total number of accrued hours to less than 160 total hours. Full-time employees and full-time temporary employees shall earn vacation leave at the full monthly rate when in a pay status for fifteen (15) or more calendar days during the pay period. When working less than fifteen (15) days during the pay period, employees will not earn vacation leave. Employees must request all vacation leave that totals five (5) or more consecutive days at least four weeks in advance of the date that the leave is requested to take place. Vacation leave that totals four (4) days or less must be requested at least two weeks in advance of the date that the leave is requested to take place. All leave is subject to the approval of management and employees must make their request using the Company Vacation and Sick Leave Request Form. Requests for leave that are not made through the Company Vacation and Sick Leave Request Form shall be deemed inappropriate and not constitute official notification to the Company of the employee's request for leave. This includes authorization made through verbal, email, or written formats not using the Company Vacation and Sick Leave Request Form. Full-time employees and full-time temporary employees shall earn sick leave. Personal illness or injury. Illness or injury to an immediate family member. The definition of "immediate family member" shall be the employee's wife, husband, life partner, father, mother, brother(s), sister(s), children, and corresponding in-laws. Employees are required to notify and report to their supervisor or manager prior to an absence for sickness or injury at the earliest opportunity. Employees must detail the reason for the absence and when they expect to return to work. Employees who do not communicate with their supervisor or manager for three consecutive days of absence may be considered as having abandoned their jobs and subject to termination. Full-time employees and full-time temporary employees accumulate sick leave at the rate of one workday (8 hours) for each full month worked. Earned sick leave may not be carried over from year to year. Full-time employees and full-time temporary employees shall earn sick leave at the full monthly rate when in a pay status for fifteen (15) or more calendar days during the pay period. When working less than fifteen (15) days during the pay period, employees will not earn sick leave. Full-time employees and full-time temporary employees may be granted sick leave when they are unable to perform their duties because of personal illness or injury, or illness within their immediate family, or because they must be absent from work for the purpose of obtaining health-related professional services that cannot be obtained after regular working hours. Sick leave is a privilege, as opposed to an earned right, and must be accrued before it can be used. Departments and administrative offices will maintain a record of sick leave accrued by each employee. Absences due to sick leave should be documented on the Company's Annual and Sick Leave Form and reported on the Monthly Service Report by department heads or supervisors, who should enter the appropriate hours of each day of absence. The minimum time to be recorded for part of any workday charged as sick leave is thirty (30) minutes. Managers or supervisors who believe that an employee may be abusing sick leave, or is claiming sick leave under false pretense(s) may require evidence of illness or injury in the form of a statement from a physician, or other medical certification. The Company reserves the right to grant temporary approval of a sick leave - subject to the receipt of sufficient evidence of illness or injury. Evidence of abuse of Company sick leave is grounds for disciplinary action, including termination. Employees who claim sick leave for the purpose of applying for another job; working a second job; or any other activity that is not illness- or injury-related shall be considered to be engaging in misconduct and dishonest behavior and may be subject to immediate termination. There shall be no payment for accrued or unused sick leave for employees upon termination or separation from the Company. Under special circumstances, employees may request an extended family leave for personal reasons. Company grants employees who must be absent for personal reasons for up to six months (The "Family Leave Term"). The birth or adoption of a child. A serious personal illness. The serious illness of the employee's immediate family, as previously defined above. Time off for family leave is available to all full-time employees or full-time temporary employees who have worked a minimum of 1,250 hours over the previous 12-month period. When possible, employees are asked to submit family leave requests 30 days in advance. The Company recognizes that taking time off for family leave may not be a foreseeable event, and will consider all situations and circumstances under which approval for the leave is being requested. Employees must first exhaust all available sick and vacation leave before being granted family leave. The Company will continue to underwrite any healthcare benefits during the family leave so long as the employee returns to work after the family leave is complete. Company reserves the right to recover all amounts it subsidizes or pays for health insurance for the employee if an employee does not return to work from family leave. An exception shall apply in the case where the employee cannot return to work because of his or her continued illness or that of a family member. All sick leave, vacation leave, retirement credits, or other benefit credits shall not accrue while the employee is on family leave. Any employee while on family leave who is found to have applied for work, accepted a position, or is employed by another company, will be immediately terminated and the Company shall recover all costs associated with the employee's family leave. Any employee failing to return to work from family leave as indicated on the Family Leave Term, or failing to properly explain the absence to the Company Human Services Department, will be considered as having voluntarily terminated his or her position. Full-time employees and full-time temporary employees are entitled to military leave of absence when ordered to active duty for training as members of the National Guard or the U. Regular full-time employees and full-time temporary employees who are ordered to active duty or drafted shall be entitled to reinstatement to their former positions or comparable positions with the same salary or pay grade. Employees placed on extended military leaves of absence will not receive pay from the Company nor accrue annual or sick leave. Full-time employees and full-time temporary employees who are required to become active duty personnel for the purpose of attending training or other active duty events shall not suffer any loss of their regular pay during the first twenty-one days of their absence from work. All full-time employees and full-time temporary employees are required to provide a copy of their training orders or other paperwork to their supervisor or manager and must also provide a copy of these papers to their Human Resources Department. Regular employees and full-time temporary employees placed on disciplinary administrative leave by the Company shall be subject to the Company Disciplinary Guidelines as defined in the Company Disciplinary Guide. Regular employees and full-time temporary employees placed on non-disciplinary administrative leave by the Company shall be subject to the Company Disciplinary Guidelines as defined in the Company Disciplinary Guide. Regular employees and full-time temporary employees selected for jury duty or to give testimony in a court proceeding that is not of their own making may request to take sick leave for the days they are required to be absent. Regular employees and full-time temporary employees shall be granted up to three days per year of bereavement leave for the death of a spouse, child, parent, life partner, brother or sister, grandparent, grandparent-in-law, grandchild, son- or daughter-in-law, mother-in law, father-in-law, brother-in-law, sister-in-law, stepchildren, children-in-law, aunt, uncle, niece, nephew, and first and second cousin. All other relationships shall be excluded unless in the case where the employee is a guardian. All bereavement leave is non-accumulative. The total amount granted by the Company to an employee shall not exceed three days within any calendar year. If additional days of absences are required, the employee may request sick leave or vacation leave. The Company assumes no liability for loss or damage to any employee's personal property, belongings, automobiles or their contents while on Company property. Employees are responsible for their own parking and transportation arrangements, Company is not responsible for any parking fees, fines, tickets, or other items related to parking, transportation, or commuting to the office for work. Changes to this Human Resources Guide. The practices described in this Human Resources Guide are current as of Current Date. Company Name reserves the right to modify or amend this Human Resources Guide at any time. Appropriate notice will be given to all employees concerning such amendments. The complete Human Resources Guide - with the actual formatting and layout - is available in this Contract Pack.